Berkeley, CA â€“ 12 July 2011 â€“ This September, the final issue of Image Comics and Top Cow Productions’ ARTIFACTS series will not only feature interior art by comic icon Dale Keown (BERSERKER, PITT), but will set the stage for the entire Top Cow Universe for the foreseeable future. ARTIFACTS, orchestrated by prolific writer Ron Marz (SHINKU, WITCHBLADE) and various artists including Jeremy Haun, has definitely proven to be a world-changing event in the Top Cow Universe. 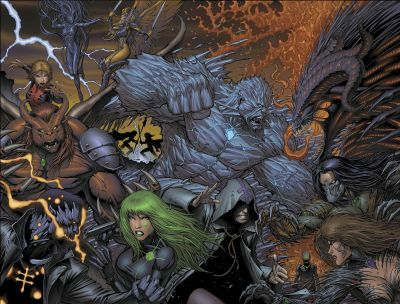 The epic story of ARTIFACTS has been organically threading the lives and fates of the many beloved Top Cow characters together, so that however events in this last issue unfold, all will be impacted. Beginning in October, Top Cow Productions will be scheduling an ARTIFACTS-related title a week, so readers can follow their favorite characters within WITCHBLADE, THE DARKNESS, and THE MAGDALENA, as well as a yet-to-be-announced fourth mystery title after the fallout of ARTIFACTS. ARTIFACTS #13 (JUL110439), a 32-page full color comic book, is available for order in the July issue of Previews Catalog for $3.99 and ARTIFACTS VOL. 2 TP (OCT108036) goes on sale August 3, 2011 for $15.99.